All too often in the sports world we hear about some of the bad "actors" who give the different sports leagues a bad name with their off the field behavior [sometimes even criminal]. In reality and thankfully, this behavior is being done by a very small percentage of all the players [just as you will find bad actors in every profession]. What we don't hear too often in the sports news [and probably that is because of the frequency of the good off the field behavior it is not really news] are those players who go out of their way to be a service to the community they live in, especially in being role models to the kids of that community. Showing my age, I remember in St. Louis we had many great men on and off the field who were involved in the St. Louis community and in helping kids. Two men that come to mind right away are Hall of Famers, Stan "the man" Musial and Lou Brock. These were two great men who made the city of St. Louis proud with their involvement and kindness off the field. In Houston Craig Biggio [a recently elected Hall of Fame Major League baseball player] and Dwight Howard of the Rockets are two examples who have been great contributors in the community and being role models are working with some of the kids in Houston. Yes, you Dwight Howard haters, I said Mr. Howard as he has really been involved working with Houston kids and being a great man in the community. In the NFL, our Texans have such a great man and a true gentleman, the defensive player of the year [who should have also been elected as the MVP of the league], Wisconsin's J.J. Watt. J. J. has gone out of his way to be involved in the Houston community and being a role model for the kids of Houston to look up to with his gentlemanly kind nature. Watch this video of J.J. Watt surprising this young singer, 12 year old, Nicholas Connors, who sang beautifully the National Anthem, at a recent Houston Rockets playoff game against the losers, ... I mean against the Dallas Mavericks. 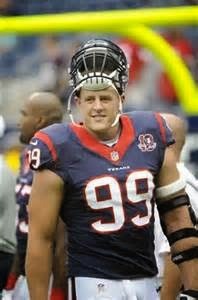 A belated welcome to Houston gentleman J.J. Watt!